Recycled-craft-supplies are plentiful around the house. Check out the recycling box first for reuseable materials that can produce some great kid-craft-ideas. I wish I was a really experienced crafter. Time doesn't allow me to jump right into this hobby full-force unfortunately. Whether you have children or not to do crafts with, it's a very relaxing way though to be creative with free time. Many forms of crafting can also be a very expensive hobby to take up, what with some of the most beautifully detailed and elaborate crafting supplies we see available in the craft stores and hobby shops for adults and kids alike. They seem to come up with more and more things to choose from everyday. Kids need to be entertained, and that will never change. Crafting supplies aren't all that eco-friendly either, and if you have a big family looking for something to make and get creative, there are other options for craft supplies out there. Recycled-craft-supplies are eco-friendly in terms of reusability, but for the most part free, and that's pretty easy on the wallet, right? One of the best forms of recycled-craft-supplies? And I say "recycled" because a lot of these items have been used for one purpose, are about to be used for another, and maybe even another after that. Check out what's around you. Mother Nature is a good beginning. Natural materials are wonderful for crafting with because they tend to be stronger. Seagrass, which is a strong plant with great flexibility makes great use of the fibers for weaving into decorative baskets. It's good for "holding objects together" too. Wreaths are at their most beautiful when made with evergreens, pine boughs or twigs. Gather up berries, acorns and pinecones to hot-glue on as decorative accents. Or, you can attach these items to circular or square frames to make seasonal wreaths or lovely picture frames. Build some miniature houses for a "village scene" at Christmas with different sized twigs. Autumn leaves dry and press nicely and are used frequently in decoupage projects. Whether you are making natural wreaths, weaving, or constructing tiny buildings, the supplies are there from nature alone. One thing we all have in our recycling boxes are toilet paper and paper towel tubes. Lots of possibilities for recycled-craft-supplies with this item. How about making a telescope? Secure a piece of tin foil over one end of the paper towel tube and wrap an elastic band over it to make sure it holds. If you put some tiny holes in the foil, it will look like you are looking at stars when held up to the light. You can make the hole pattern any kind of design you want. Children think this effect is pretty neat. Painting toilet paper tubes and then glueing them to something solid like a wood base makes a great holder for crayons, rulers, and pencils. They're good for making the bodies of angels, or animals too. Color or paint and attach all kinds of accessories. Tear up old newspapers and shred it for paper mache projects. Keep old magazines too to cut out pictures to decorate boxes and bottles with. Finished with your cereal boxes? The large sized ones especially are great for making colorfully decorated gift boxes, or a stand up holder for magazines. Many projects call for paper plates because of the round shape, but a cereal box is much sturdier and you can cut circles out of the sides to make things with. How about soup cans for instant flower or herb gardens? These make wonderful recyled-craft-supplies when cleaned out and filled with dirt for your child's first window sill garden. Kids can make a row of them, and if you have popsicle sticks? Save them too for using to stand up in the soup-can garden and write on them to identify what what the plant is. You could glue the seed packet package on the stick. Old socks and gloves make wonderful recycled-craft-supplies in the form of sock puppets, finger puppets or dolls. You only need some felt and some glue for eyes; pieces of wool and yarn make for great hair. Old birthday cards or Christmas cards can be cut up, with the main picture pasted onto the outside of a glass jar you no longer need. Set a tea-lite inside for a pretty candle that will light up the picture from the inside. If you have any used clothing at all, keep an item or two (plaid is great!) to use bits and pieces for a scarf on a paper-plate snowman. If your item is too ragged to give to someone else to use, be sure to keep the buttons before you make a rag out of it. You know, soap is something we don't even consider saving as we toss little bits and pieces and chunks into the garbage can everyday. Check out the variety of ways for reusing soap pieces instead of being wasteful of them. 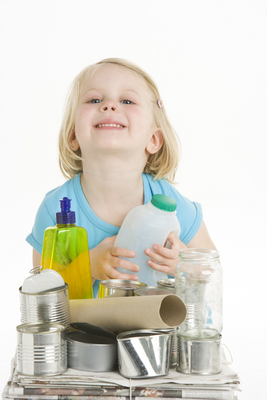 There are too many items to list that land in the garbage that can make the best recycled-craft-supplies possible for some awesome kid-craft-ideas. This list is endless. Within a week, I bet most of us could come up with a box of all kinds of things to keep a child occupied for days. Children are so creative! How about vegetable art? These make for wonderful eco-friendly-crafting-supplies. Take a potato and cut it in half. Use this as a stamp, but make a design by carving into the potato half first. Dab a little water base paint in and stamp interesting designs onto paper. 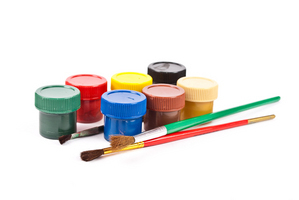 Speaking of paints, many items tossed in the garbage are good to keep for painting projects. Frozen dinner plates with the 3 or four compartments are perfect for this. From buttons to potatoes, pine-cones to twigs, old cards to baby food jars - you can see that there is so much free and available just around the home and from the outdoors. Gather up and keep these items for your kids to amuse and stimulate their sense of creativity. Lower your carbon-footprint. Turn your "garbage" into the best recycled-craft-supplies for free. Use the simplest of common everyday household items to create something that costs less and is eco-friendly too. Certain movements, like continuously working with hands, helps develop fine motor skills and coordination. Children are so visual, that's how they connect to what's around them and what they are thinking. A shy child putting experiences and feelings to paper or to material projects can give parents a window into their thought patterns. Give children the oddest pieces of materials and they will gravitate to them and create something out of them. Young children know no boundaries and their imaginations can be explored with no limits making them quite productive if given the opportunities. Talents can be discovered and encouraged as children grow. Have you made some great craft projects out of recycled items? We'd love to hear about how you did it and share the idea with others. Whether it's a holiday craft, kid's craft, or everyday craft, let us know.